Looking to crochet a cute and easy granny square this spring? Look no further! 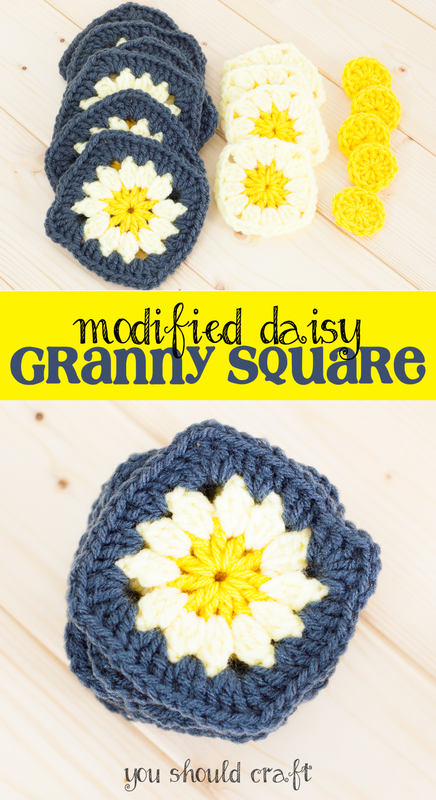 These modified daisy granny squares are only three rounds, can be used with classic granny squares, and have an adorable daisy flower at the center. They’re the perfect crochet project for spring! Thanks for stopping by — I’m so glad you’re here! Are you ready to crochet a granny square that’s perfect for spring? Perhaps one with an adorable yellow daisy at the center? I love gray and yellow together, so when I was at JoAnn Fabrics and found this awesome gold yarn from Big Twist, I knew what I had to do. It was destiny, ya’ll! Ha, maybe not, but I paired it with a lighter yellow and two shades of gray and the daisies came out dope AF if I do say so myself! The inspiration for the modified daisy granny square pattern was an afghan block called Julia’s Flower, from MoCrochet. Julia’s Flower is a larger granny square, but I loved the center! I’d seen other daisy squares online, but they seem to be puffy, and kind of textured. These daisy squares lay flat. Each square is only three rounds, and the final round is the same as classic granny squares, so you could easily rotate between daisies and classic squares in your project. It also means the daisy squares can be connected using the join-as-you-go technique, which is what I used on my daisy pillow. That’s enough back story, right? Are you ready to rock? First, check your crochet stash or hit up JoAnn Fabrics for supplies! 3 colors of worsted weight yarn (I used Gold from Big Twist, and Pale Yellow and Charcoal from Red Heart Super Saver. Check out the video tutorial!